CURT front mount accessories maximize the usefulness of your tow vehicle and give you an added edge on and off the road. A CURT front mount hitch is the perfect way to make your vehicle the ultimate towing machine, and with it comes a variety of towing possibilities. CURT receiver-type hitch accessories include the CURT step pad, skid shield, winch mount and more. 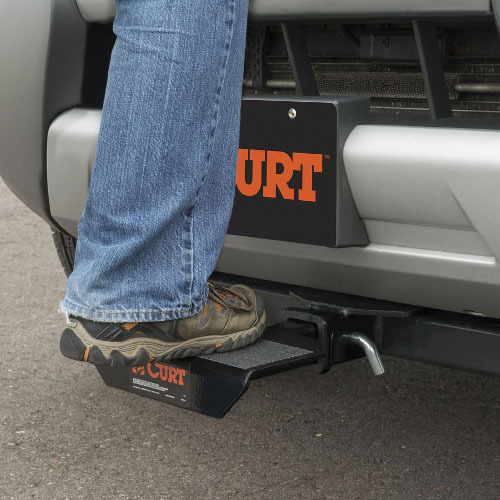 The CURT hitch-mounted step pad is an anti-skid platform that gives you a step up when working under the hood of your truck or climbing into the back of your truck bed. 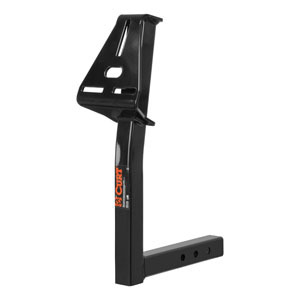 Depending on where you mount this accessory – on a front mount hitch or on your rear mount trailer hitch – it provides solid footing that can quickly be installed and removed as necessary. The CURT hitch-mounted step pad offers a safe and generous platform with its 6 3/8" x 10 3/4" surface. Plus, with its flat design, the CURT step pad easily stores in your vehicle to be available whenever you need it. This front mount accessory is made from strong steel and comes with a durable gloss black powder coat finish for long-lasting protection against wear and tear. 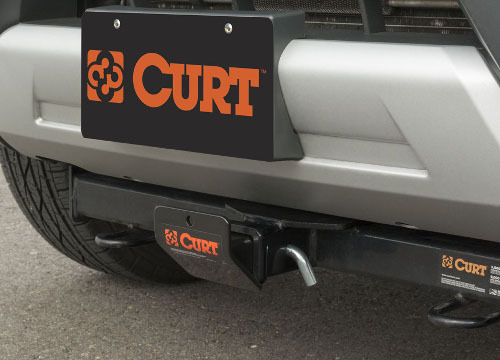 The CURT hitch-mounted skid shield is designed to mount onto your front mount hitch and protect the receiver and the underside of your vehicle against rocks, logs and other obstacles. The skid shield is especially useful for off-roading to help protect the bumper and other components on the front or rear of the vehicle. It is made from solid steel and is coated in a durable gloss black powder coat finish to resist rust and scratching. The CURT hitch-mounted spare tire mount inserts into the 2” x 2” receiver tube opening of your trailer hitch and allows you to attach a spare tire onto the front or rear of your truck, van or SUV. It measures 24” from top to bottom and features multiple mounting holes on the shank to provide plenty of clearance for your bumper and the rear of your vehicle. The CURT spare tire mount is designed to mount onto a variety of vehicles and to accept a number of different wheel types. It is especially useful for off-roading situations and for creating a little extra cargo room inside your vehicle. The CURT hitch-mounted winch mount provides a solid mounting platform and fits a variety of winches. It is also available with handles to allow for easier handling and moving of the winch when removing it from your vehicle. They also offer a firm handhold during operation. The CURT winch mount is equipped with a shank that fits into a 2” x 2” receiver tube and has three mounting holes for an adjustable design. Make sure your license plate is in plain view with the CURT hitch-mounted license plate holder. This accessory is made from solid steel and easily attaches to your front mount hitch or rear trailer hitch with a pin and clip.